Whether the main purpose of the training is to compete, run a race, good health, community or why not all at the same time, most of the training methods are the same. Everyone who wants to develop by bike drives distance, fast distance, some speed intervals, technology and so on. What is then specific to the competition training? Contests have, in addition to joy, community, etc., the goal of being first over the finish line and choring a winner. It means physically that you have to practice your ability to cycle quickly, preferably for a long time to be competitive. Driving line-ups / gp involves varying traffic due to tactics. Sometimes it goes slowly and sometimes incredibly fast. The training is designed to cope with high speed pace and tempo changes, but it will also increase the ability to drive faster than the aerobic system passes, for short periods, ie. above its lactic acid threshold. With proper training, the muscles can handle it without the bones blurred. In addition, one has to exert the ability for rapid recovery, so that you can keep up with a high-pitched and harsh pace. At pace, the requirements profile is slightly different. Here the competitions are determined based on who has the highest speed around the lactic acid threshold. If the pace is short, you can afford to drive right above the threshold, that is to say. The anaerobic ability becomes something more important, while long pace ends just below or at the anaerobic threshold / AT. Regardless of distance, pace is about being able to use their forces as evenly as possible and the ability to sit aerodynamically with sustained force in the pedals (some lose a lot of force in tempo position). The more profound the profile of the team becomes, the more important the competitor’s weight in relation to his physical ability. You usually talk about Watt / kg or max. Oxygen uptake / kg. This is of less importance in Sweden, but there are a few competitions where weight can play a crucial role. How do you train these qualities? 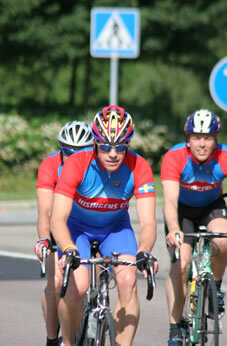 The ability to cycle fast for a long time, so-called speed endurance. It is then about different forms of intervals around its anaerobic threshold, both themselves, in pairs and through different forms of team pace. The anaerobic ability to sustain a lot of lactic acid (lactate) can be trained at short intervals with maximum intensity. The ability to attack, twitch and sprint is trained through various forms of start-ups and spurts. Exercise with high or maximum intensity is not relevant to a large extent until the spring and the season begin to approach. Tactics in the form of thought thinking and individual thinking, who are we going to drive for today? who will try to be in early breakout? who will wait? what opponents do we need to keep an eye on? shall we help with the pull job? When is it appropriate to attack? When is it best to wait? When will I start the spur? how much should I go for breaking out? Technology in the form of tempo training to learn to get out at the right pace and keep even speed, basketball skills for GP race, how do you lie in the edge wind? how long do you have to do? In what direction should I beat? best position in front of a question? What gear should I have for a spur or a steep hill?